Durable maple construction for many years of use! Lightweight and breaks down flat for easy transportation. 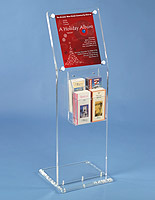 Includes 4 clear acrylic literature pockets for displaying publications. 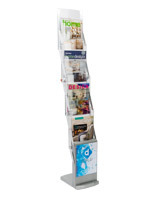 These magazine stands, literature holders are an effective marketing mechanism for any business. 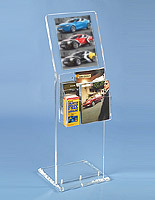 This literature holder can be used to promote new products, menu listings, special offers or ongoing events. 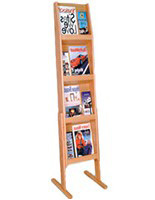 Specially crafted from high quality maple, these literature holders are bound to enhance any environment. Along the stand of this post are regularly spaced (one inch apart) notches to place your pockets at any level appropriate. Inspired by European design, these literature holders feature a sleek, sophisticated and functional styling. 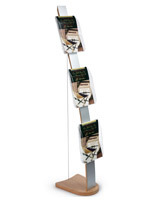 These literature holders are perfect for use in store fronts, trade shows, bookstores, real estates and restaurants. 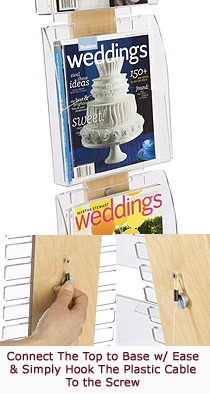 Use these literature holders to create an impressive and attractive display in no time! 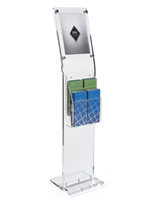 These poster displays, sign stands and other literature holders give the capability to change your display however fitting. 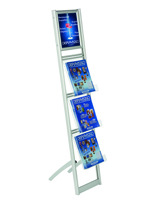 We include these literature holders with 4 additional acrylic pockets for displaying brochures, magazines, publications or any other information you'd like to display. 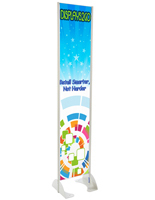 These literature holders, also known as sign stands require no adhesives, screws or fasteners to place the pockets where you desire. These magazine racks, literature holders allow for the quick changing of parts and easy assembly, make setting up your display a breeze. It can also goes flat for easy packing and storing. 11.0" x 59.0" x 20.0"
9.5" x 11.5" x 1.3"